In the shadow of the mighty Yeavering Bell hillfort to the south was built one of Northumbria’s ancient royal palaces, Ad Gefrin. This was around 580-600AD, a little before the dawn of the kingdom’s ‘Golden Age’. Within a century or so it had been abandoned, but enough of it remained for it to be dramatically rediscovered in the late 20th century and identified as one of England’s most significant Anglo-Saxon sites. Yeavering had long been a centre of attraction for Northumbria’s early settlers. From the Stone Age to the end of the Iron Age, its hillfort had been the subject of reverence. We’re not quite sure what became of this lofty settlement during the Roman period (by which time it was falling out of use), but when the legions had gone and were replaced by new invaders from the continent, the Angles, the area was to make a spectacular return to prominence. 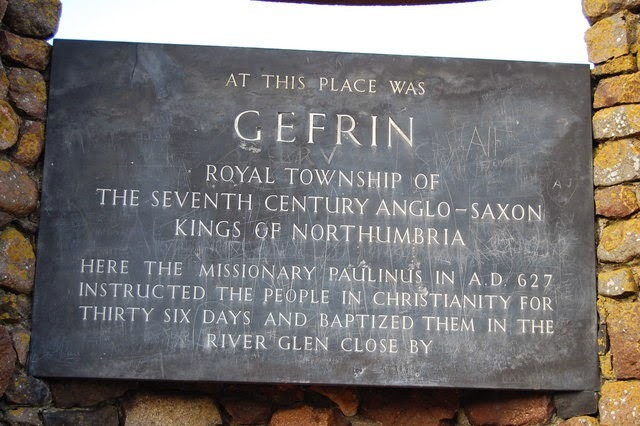 Such was the strength of the collective memory in these parts that the new palace of the Anglian royal family was given the name Ad Gefrin, a clear corruption of the old Yeavering placename. It wasn’t a permanent abode for the top brass, but more of a temporary affair – with the king travelling his kingdom non-stop, dispensing justice and favours and collecting rents as he went. It is thought that a place such as Ad Gefrin may have been utilised once or twice a year. Perhaps the most famous of these stop-overs was when King Edwin, following his marriage to a Christian princess, invited a Roman missionary up from Kent in 627AD to baptise most of the local population. At Ad Gefrin there appears to have been a huge Main, or Great, Hall, a theatre, several specialist outbuildings (some of them very large) and a ‘great enclosure’. The writings of Bede, compiled a few years after Ad Gefrin passed into history (probably before 700AD), kept the loose story of the famous old site alive for the ensuing millennia or so. Then, with the development of aerial photography in the mid-twentieth century, traces began to be unearthed of the site and the pieces were gradually put back together. During 1953-62 extensive archaeological work brought the palace back from the dead, and it was obvious to all concerned that this was a major discovery. Bede’s famed Ad Gefrin had been found. As well as the size of the buildings and the extent of the site, it is apparent that the royal complex was built into an existing landscape of occupation. There is even a suggestion that the Christian temple which was found had most probably been converted from a pagan equivalent. The experts reckon, too, that the site may have been destroyed by fire and rebuilt twice during its relatively short lifetime. In time, though, the rulers thought it best to move on, and the magnificent venue at Yeavering was left to rot. See also the official website. Of all the magical, mystical locations in the entire North-East of England, many would argue that the twin-peaked hill of Yeavering Bell on the edge of the Cheviots is the most evocative of them all. It is the much heralded site of the region’s largest Iron Age hillfort – with a grand history stretching back further still. It is not a huge hill at a modest 361m (1,182ft), but such is its situate on the very northern edge of the Cheviot range overlooking the rivers Glen and Till and the Milfield Basin that it has always loomed large over the lives of those who have lived there. From at least the late Neolithic period (around 4-5,000 years ago) man has looked up in awe and wonder at the Bell, using it to align stones and monuments – and to build a temple there, too. Among a patchwork of ancient remains a Neolithic burial cairn adorns the eastern summit. During the Bronze Age (2000BC – 800BC), again, man made use of the hill – there is certainly plenty of evidence of burials in the immediate vicinity. But it is in the Iron Age (800BC – 50AD) that the site came into its own, and it is from this era that the encircling wall on Yeavering summit dates. It would have been a tribal stronghold of the mighty Votadini, with walls 10ft thick and 8ft high in places enclosing a spacious 12 acres. The remains of around 130 stone and timber roundhouses, as well as the wall itself, can still be made out – the latter being still remarkably substantial. This equates to a sizeable settlement for its day, though no one has quite been able to work out why it was situated where it was (on top of an exposed hilltop). Perhaps it was a safe, defendable position, a high status location, a combination of both, or perhaps something else entirely. There are four entrances to the ‘fort’, one of which incorporates a guard-house; additionally, there is an inner, much smaller fort. There is still much to learn about Northumberland’s premier archaeological site. No one seems to know exactly when, or why, it was abandoned (though finds there extend into the Romano-British period). However, the hill’s magnetic appeal never did fade completely, as a little after the Romans left a royal palace would spring up in the shadow of Yeavering Bell about a mile to the north. Copyright issues prevent me from reproducing images from elsewhere, but some great pictures can be found here. The fort is open to the public – see the leaflet available here. Most history fans will know all about the Battle of Flodden of 1513. Big English victory, crushing Scottish defeat … and the Scots lost their king on the battlefield, too, of course. 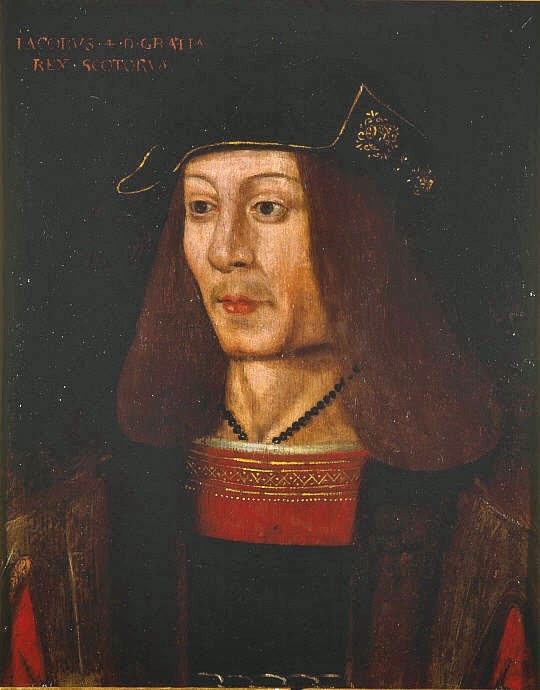 However, in the blood, mayhem and general confusion that followed, no one seems to quite know for sure what became of James IV’s body. If he died at all, that is. Accounts of almost all aspects of the story vary – sometimes wildly. What is known for sure is that his army lost heavily and his reign very much ended on that fateful autumn day a little over 500 years ago. He was almost certainly slain in the field, possibly after having stripped himself of his royal regalia to prove he could and would fight as fiercely as any ordinary soldier. He was known to be fearless in the fray and such a demise would not have been out of character. In the mess that was left after the battle it could not have been easy identifying the ex-monarch, especially if he’d removed his royal garb. Lord Dacre was supposed to have found the corpse, probably on the small hill on Branxton Ridge overlooking Branxton Church. Dacre then had the body taken to Berwick, where it was identified by two Scottish courtiers, before it was embalmed and taken, firstly, to Newcastle, then York, and afterwards onto London (Sheen Priory in Surrey). In the meantime, what was left of the late king’s royal gear found its way to Durham Cathedral. There was a suggestion that the body be forwarded to English King Henry VIII, but this seemingly never happened. Then rumours of James’ survival began circulating. In Lucan-esque fashion, he was spotted abroad on several occasions, having slipped away at the height of the battle and thence into exile in far off lands; and there were counter-rumours that he had escaped the battlefield and was caught and killed during the Scottish retreat. Some claimed that the recovered corpse was actually that of a ‘Lord Bonhard’. The ‘official’ body lay at Sheen Priory, London, for a good while. Henry VIII wanted to show some respect and have it interred at St.Paul’s, but as James had been excommunicated this proved difficult and it seems to have just kicked around the priory for years. After the Reformation it seems to have gone missing, though another story has it that the head was secreted away and hurriedly buried in the charnel pit of St.Michael’s Wood Street in the centre of London. This church has long since disappeared, and the site is now occupied by a pub (ironically called The Red Herring). Sheen Priory, on the other hand, is now a golf course. Oh, and there is also a tall tale involving spectral riders snatching the body from the battlefield to prevent the English getting their hands on it. At last, though, a fact: if King James IV of Scotland was slain in the mud and blood of Flodden Field, which is very likely, then he achieved the notable feat of being the last Scottish – or, indeed, British – monarch to be killed in battle. But can we have such a fact without a body? © Copyright Andrew Curtis and licensed for reuse under this Creative Commons Licence. Until the last few decades the town of Branxton, North Northumberland, was famous for only one thing: it was the site of the Battle of Flodden. A few short yards to the south, the largest battle ever fought between England and Scotland was played out across a couple of nondescript fields in 1513. Branxton’s church, in fact, acted as a temporary mortuary to many of the thousands of dead that the encounter threw up. 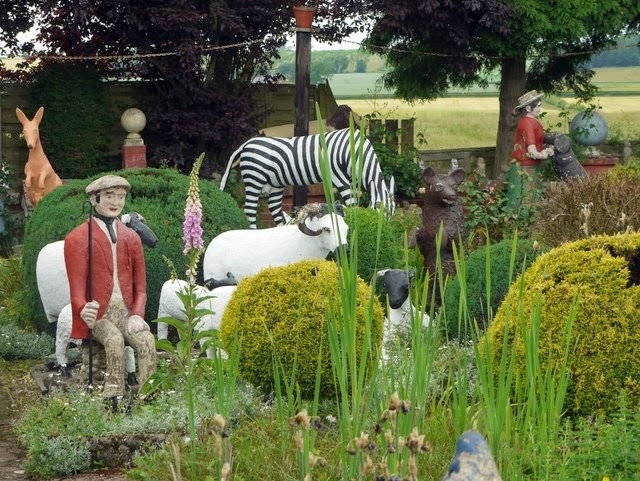 Of late, though – and including through to the present – visitors to the village may well be calling in in pursuit of a very different tourist attraction: The Cement Menagerie. First conceived of in the early 1960s it quickly grew to unfeasibly large proportions and, as a crowd-pleaser, it is surely unique here in the UK, and quite possibly globally. It’s on display in the garden of The Fountain House: around 300 ‘art brut’ statues crammed into less than an acre of space – and all open to the public, too, for free. It was created by a couple of pensioners, primarily for the entertainment of their disabled son, whom they insisted on looking after themselves at home rather than having him institutionalised. The names of the two eccentrics were John and Mary Fairnington, and that of their only child (who was born late to them), Edwin. Incredibly, the project wasn’t started until after John, who was a joiner, had retired in 1961, aged 80… and they just carried on rolling out the statues for around a decade until Edwin’s death in 1971. A former work colleague of John’s, James Beveridge, lent a considerable hand, too. The figures were made from wire netting, stuffed with newspapers, then cemented over and painted. The garden has slowly developed around them – the ‘them’ in question being animals, in the main, but also including some local village characters and famous folk such as Churchill and Lawrence of Arabia. There is also a shrine to Robert Burns, as well as many little poems and ditties of his (and others) scattered here and there. Old John died in 1981, aged 98, and the garden, by a circuitous route, eventually ended up back in the family’s possession – and it is now cared for by his present-day relatives.